Guacamole Tomato Boats are the perfect bite-size appetizer with a Tex-Mex flare. 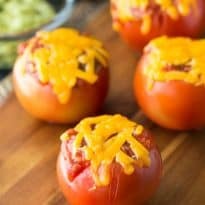 Blistered tomatoes that are stuffed with guacamole and salsa, then garnished with cheese. If you are looking for a quick and easy appetizer, this tomato boat recipe is for you. Tomatoes are something we can’t get enough of. When they are baked in the oven and have that tenderness, it makes the flavors stand out even more. This Guacamole Tomato Boat recipe is one I have been preparing for a few years now. Anytime we have a party or go to a potluck, I pack up a batch of these. With a little prep, you can have these ready to share with friends and family. If you have never tried a stuffed tomato, you have to try it out! We love stuffed mushrooms, and this was a fun twist that will leave you reaching for one more. Bacon wrapped water chestnuts are salty, crunchy, and a hint of sweet. Bite-size appetizers that are dynamite to serve up your guests. Parmesan crisps are a low carb appetizer that is cheesy, crispy bites. Pair with your favorite dipping sauces or eat as is. Best of all, just two simple ingredients are needed for these crisps. Buffalo Chicken dip is spicy, creamy, and of course cheesy. Pair with bread, chips, celery sticks for everyone to enjoy — one of our favorite dips to serve guests. How do I know when my tomatoes are ripe? Squeezing your tomatoes is the best way to tell the ripeness factor. You can give your tomatoes a gentle squeeze, and if they are firm with a little bit of give, they are pretty ripe. Make sure you don’t see a lot of dimpling or wrinkles on the tomato skin. If you do, they are overripe and could be going bad on the inside. You can buy a special scoop for spooning out fruit and vegetables online. Or you can go the classic way and use a spoon. 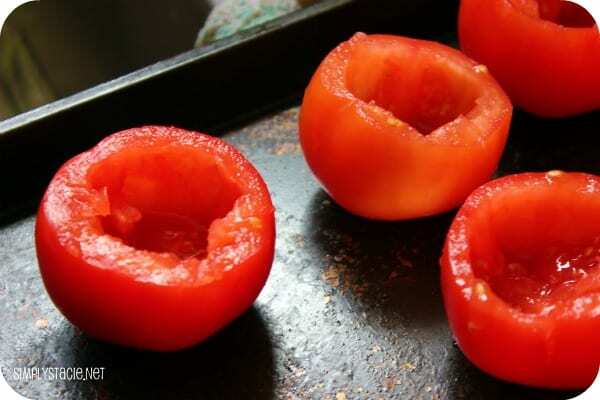 Just slice off the top of the tomato, and gently spoon out the seeds. Just do your best not to push the spoon all the way through the tomato, or it will not work. Can I stuff regular tomatoes instead of small ones? Absolutely! You would just need more filling for each tomato. These would make a tasty side for you Taco Tuesday dish. We prefer the bite-size option, but yes, you can use larger tomatoes. This could be a great dish for someone who wants meatless for dinner. How to store Guacamole Tomato Boats? If you have leftovers, just place leftovers in an airtight container. Place in the fridge for up to two days. The tomatoes will become softer as they sit in the fridge. You can eat them cold or warm them up in the oven if you prefer them hot. Tomato boats will change in texture when you reheat once they have been chilled. 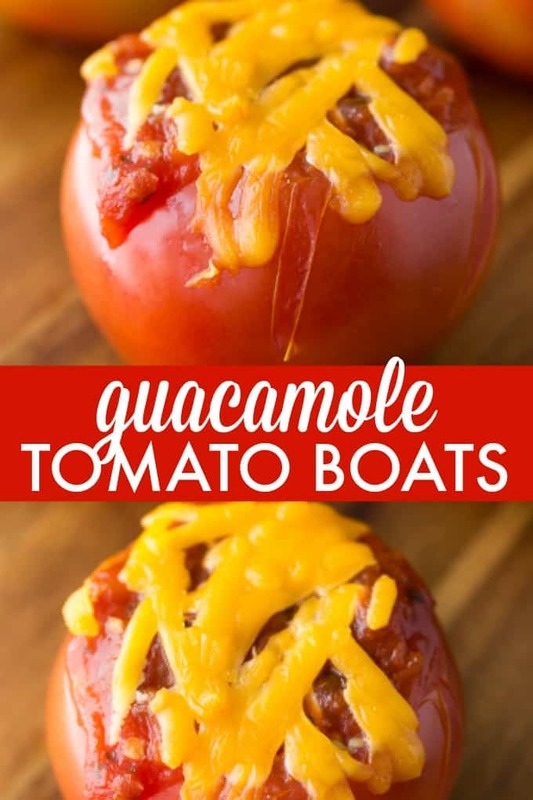 Do you use homemade guacamole for tomato boats? You are welcome to use store-bought or homemade guacamole for the Tex-Mex tomato boats. Sometimes I will make a homemade batch of guacamole and other times I cut a corner to speed up the process and buy pre-made. Just buy a brand that you like. The same thing goes for the salsa; you can use homemade salsa if you enjoy making your own. Start by preheating your oven. While it is heating, you can assemble your tomatoes. Just slice off the top of each tomato, and scoop out all the seeds on the inside. Then you just fill the tomatoes with a layer of guacamole, then salsa, then top with cheese. Bake for five to seven minutes, or until your cheese is melted and tomatoes are blistered a bit. Then serve right away. These tomato boats taste best when served fresh! As you can see these guacamole tomato boats are so quick and straightforward to make. You can create as many or few as you would prefer. No measurements needed, just a little of this and a little of that is all that is necessary! Have you tried a Guacamole Tomato Boat before? 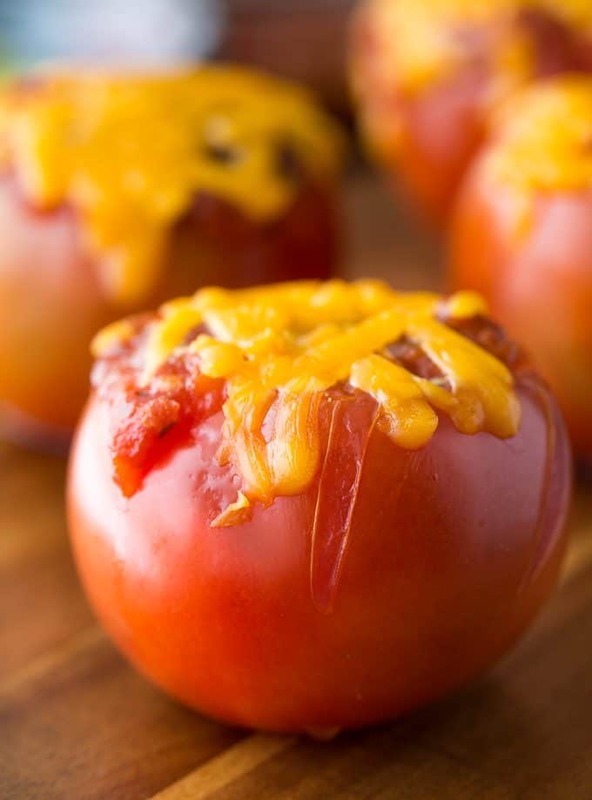 Stuffed tomatoes with a Mexican flair! Serve them at a party or for a healthy snack. Slice the top of each tomato and carefully scoop out the inside. Make sure to not puncture the bottom. 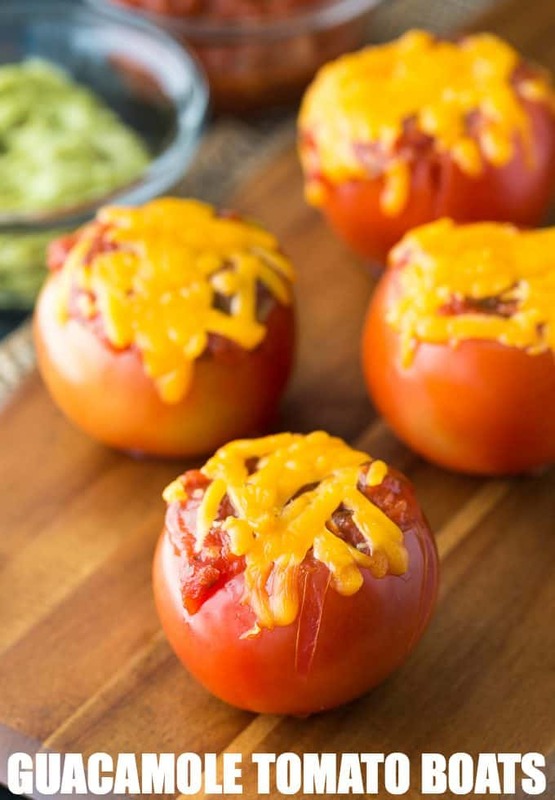 Fill each tomato with guacamole, then salsa, and garnish with cheddar cheese. Bake for about 5 to 7 minutes until the cheese melts. Ahhhhh- these! yes! I love everything about these…except I would need a few margaritas to go with them! I think this is a great way to incorporate more veggies – they look so good! Pinning! Thanks for sharing your recipes with us this week at Brag About It! My husband loves tomatoes! I will make this for dinner with a side salad and some mexican rice, pinned for later! Thanks! I love this idea, just what we need now that it’s fresh tomato season! These look amazing! I’ve tweeted and am saving to share on my FB page. Yummy! Oh those look so yummy! Thanks for the idea. These look delicious! I never would have thought to stuff tomatoes. Thank you for sharing at Merry Monday!